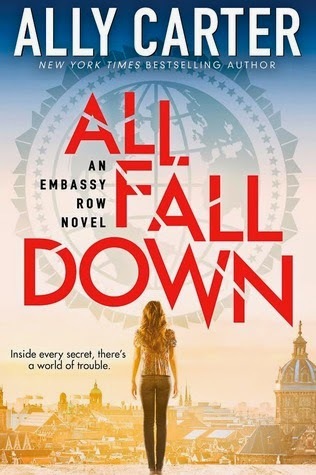 Today I am reviewing 'all fall down' by Ally Carter. It is Ally Carter's latest novel and is being released on 5th Feburary. his exciting new series from NEW YORK TIMES bestselling author Ally Carter focuses on Grace, who can best be described as a daredevil, an Army brat, and a rebel. She is also the only granddaughter of perhaps the most powerful ambassador in the world, and Grace has spent every summer of her childhood running across the roofs of Embassy Row. Thoughts:I was super excited for this book as Ally Carter wrote my favourite series 'the Gallagher girls' and she did not disappoint. I thought it was a really interesting concept and it was very well written. My only problem with this book is that sometimes I got a bit annoyed with Grace. I thought at points she was a bit whiny but apart from that all the characters where great.my favourite being Alexei, really want more of him in the second book. All in all I loved the book and sped through it. I am going to give it 4/5 stars. Just because I think liking the main character is such an important thing.